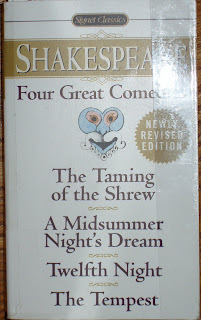 My son was reading this one in class, and since I managed somehow to make it all through school and university without reading any Shakespeare, thought I would give it a try. I really enjoyed it. I found my self laughing aloud during the scene where Petruchio's wedding clothes and the state of his horse is being described. My daughter studied "A Comedy of Errors" last year and came home saying that Shakespeare is a dirty, old man. Now I understand her comment. I will be looking forward to reading more of his work. I have never read and of Shakespeare's work. Have always wanted to, but never got around to it. I'll have to put this book on my TBR list. Take Care! !